This entry was posted in collectibles and tagged die-cast on December 30, 2012 by James Day. To finish our end-of-the-year collectibles series, we have a last Hot Wheels die-cast MINI for 2012. A year ago we posted the 2011 Hot Wheels MINI CHALLENGE in Blue, Chili Red, and White. For late 2012, Hot Wheels produced a MINI CHALLENGE in yellow with the same graphics as the previous three colors. The yellow version is found in the Hot Wheels Gift Pack containing 9 cars. This entry was posted in collectibles and tagged die-cast on December 29, 2012 by James Day. Continuing our end-of-the-year collectibles series for 2012 is the Hot Wheels X-Raycers Morris Mini. It is available only as part of the X-Raycers 5-Pack. The Morris Mini has a transparent green body with yellow windows and 10-Spoke wheels. The side graphics are white checkers and a No. 1 meatball. They are available at Toys-R-Us and other retailers. This entry was posted in collectibles and tagged toys on December 28, 2012 by James Day. The Go Mini Stunt Launcher is compatible with G0 MINI Stunt Racers. It includes a unique stunt racer. Charge the stunt racer using the stunt launcher and then release! No batteries required! Go MINI Stunt Racers are not available from MINI MotoringGear, but can be found at Toys-R-Us. for $9.99 each. The Go MINI Stunt Launcher is $19.99. This entry was posted in collectibles and tagged toys on December 21, 2012 by James Day. 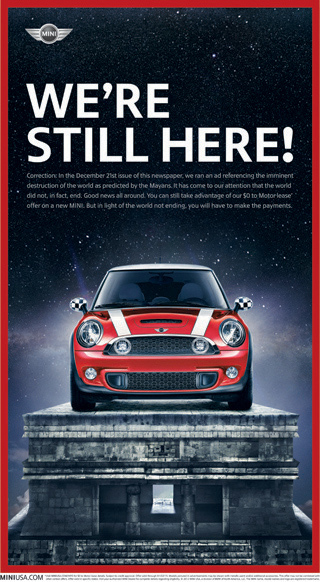 This is the final Go MINI item that appears in the MINI MotoringGear 2012/2013 catalog. Pictured above is the Go MINI RC Wolf. It is already available at Toys-R-Us and is coming in January 2013 from the MINI MotoringGear catalog. The price is $24.99 at Toys-R-Us and $30.00 in the MINI MotoringGear 2012/2013 catalog. Remote-controlled MINI Cooper S with lights, sounds and steering wheel-shaped control unit. Use the handbrake and turning function for amazing stunts. Dimensions: 7″ x 8 1/4″ x 11″. Imported. The Go MINI RC Wolf is made by Golden Bear Toys under license from MINI. This entry was posted in collectibles and tagged toys on December 20, 2012 by James Day. Go MINI Freestylers are larger than the Go MINI Crew-zers and each has a different feature. Already available at Toys-R-Us and coming in January 2013 from the MINI MotoringGear catalog are these five Go MINI Freestylers toy cars: Charge, Bulldog, Tiger, Beats, and Revs. The price is $23.00 each on MINIMotoringGear.com but $22.75 each in the MINI MotoringGear 2012/2013 catalog. Every freestyler model has a special feature. All are based on the Cooper S. With integrated batteries. Ages: 3 to 99. Dimensions: 4 3/4″ x 5 1/4″ x 7 1/4″. Imported. Go MINI Freestylers / Revs 80452327868 Emits car noises when pushed or pulled. Awesome animated roof design. Go MINI Freestylers / Beats 80452327869 With ultra-cool sound and an equalizer on the roof. Available at the touch of a button. Go MINI Freestylers / Charge 80452327870 With light show, cars sounds and flickering flames on the roof. Go MINI Freestylers / Tiger 80452327871 Touch the windows to hear the roar of a tiger and fun car sounds. Go MINI Freestylers / Bulldog 80452327872 Press a button and watch the bulldog come out of hiding and bark. The Go MINI Freestylers are made by Golden Bear Toys under license from MINI. This entry was posted in collectibles and tagged toys on December 19, 2012 by James Day. Already available at Toys-R-Us and coming in January 2013 from the MINI MotoringGear catalog are these five Go MINI Crew-zers toy cars: Checks (not shown), Chilli, Jaxx, Sparks, and Trix. The price is $7.50 each on MINIMotoringGear.com but $8.00 each in the MINI MotoringGear 2012/2013 catalog. The miniature MINI Cooper S comes in 5 great designs and with individual license plates to play, collect, and have fun with. Definitely not just for kids. Ages: 3 to 99. Dimensions: 2¾” x 2 3/8″ x 4″. Imported. The Go MINI Crew-zers are made by Golden Bear Toys under license from MINI. This entry was posted in collectibles and tagged die-cast on December 18, 2012 by James Day. Matchbox began making die-cast cars in 1953. So 2013 marks Matchbox’s 60th anniversary and they are celebrating with commemoration editions of 24 popular cars. Here we have the Matchbox 60th Anniversary Commemorative Edition Austin Mini Cooper S. The car is painted in gold with a Union Jack on the roof. The package comes with a collectible box. The Austin Mini Cooper S is number 9 out of 24. The Matchbox catalog number is Y5335. See other Matchbox Minis/MINIs and all die-cast Minis/MINIs we have featured. 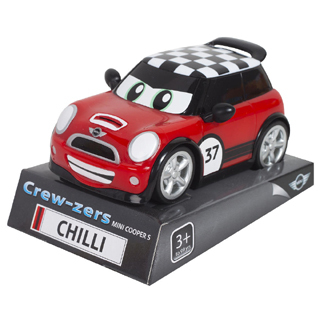 For you die-cast Mini collectors, Matchbox has included a classic Mini for 2013. The 1964 Austin Mini Cooper comes in bright red with a large bull’s-eye graphic on the sides. The die-cast Mini is part of the MBX Adventure City series and number 12 of 120 in the entire 2013 Matchbox line. This 2012 MINI Countryman Rally Hot Wheels die-cast car was originally supposed to be part of the 2012 Hot Wheels collection. For whatever reason, it was delayed and now is part of the 2013 HW Stunt collection. The ’12 MINI Countryman Rally is green with a white roof. Side graphics include white checkers and the No. 27. It is car 93/250 in the Hot Wheels 2013 collection. The QR Code on the back takes you to the Hot Wheels My Car Collector ’12 MINI Countryman Rally page.